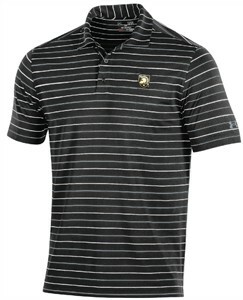 Made by Under Armour for the college sports fan that wants to show off their Collegiate pride all year long the Army Black Knights Fashion Stripes Polo Shirt which comes with sublimated striping will take care of that with a little fashion flair thrown in. Constructed from 5.29 Oz. 100% Polyester Material which helps wick moisture away from your body to keep you cool and dry this Standard-Fit Polo shirt will look great on Football or Basketball Game Day or on the Golf Course and with its left chest rubberized Black Knights graphics everyone will know which NCAA team you cheer for when the teams take the field. NCAA OFFICIALLY LICENSED: Team Graphics and colors are licensed by the respective team and league and are printed high quality logos. Every Polo Shirt comes with a licensed tag to ensure that this is Authentic Gear For Sports and NCAA clothing. MACHINE WASHABLE MATERIAL: This Short Sleeve Polo is constructed from 100% 5.2 Oz Polyester material that comes with a Standard fit body works great as an all-purpose shirt no matter what your activity . SCREENED TEAM GRAPHICS: Since this shirt is made by Under Armour it follows stringent quality guidelines so the team logos should give your season after season of wear so you can stand out at Army games all season long. SHOW OFF YOUR TEAM SPIRIT: This Short Sleeve Striped Polo makes a great gift for any Black Knights fan you may know so they can show up at the game and there will be no mistake which team is their favorite.